But just like many things the mainstream media and consumer marketers latch on to these days, antioxidants have become a buzz word for selling hype and added profits. So, how do you know which sources have the most concentrated natural antioxidants? Antioxidants are generally classified into two broad categories…water soluble (hydrophilic) and lipid soluble (hydrophobic). Water soluble antioxidants – These are present in aqueous fluids, such as blood and intracellular and extracellular fluids. They react with oxidants in the cell cytosol (fluid portion of cytoplasm) and the blood plasma. Examples of water-soluble antioxidants include… vitamin C, glutathione, and catechins. Lipid soluble antioxidants – These are localized to cellular membranes and lipoproteins. They protect cell membranes from lipid peroxidation. * Examples of lipid-soluble antioxidants include… vitamins E, A, and beta carotene. For a phenomenal water-soluble antioxidant, I strongly recommend Purple Defense with resveratrol. You can check out my site for more details on this extraordinary formula. Up until now, this natural super-nutrient has not received the attention and notoriety I believe it deserves. Most folks don’t have much of a clue why salmon have such distinctive coloring. There’s something very unique that gives them their unique reddish-pink color. If you guessed it is an antioxidant… you are correct. But it’s not just any antioxidant… and it’s not only responsible for salmon coloring, but also provides them with the endurance they need to swim for several days against the current to reach their spawning grounds. Astaxanthin belongs to a class of naturally occurring pigments called carotenoids. Even though there are more than 700 naturally occurring carotenoids, most people are probably only familiar with a few and the most common one is beta-carotene.. Many carotenoids may be easily obtained simply by eating a good diet rich in fresh organic produce. However, the carotenoid that possesses the super lipid soluble antioxidant I’m referring to is challenging to come by. I have a much more practical solution for you to get adequate amounts of this super-antioxidant artillery… to help you benefit like salmon do*… coming up. Well, just how does it do all that? It all gets back to the relatively unknown carotenoid… now believed to be one of the most powerful antioxidants found in nature. As a source of antioxidants and vitamin A, carotenoids are critical to the photosynthesis process. Plus, as antioxidants, they protect plants and organisms from free radical damage caused by light and oxygen. As you probably already know, I strongly believe in using sun exposure to get your body to produce critical amounts of vitamin D. However, over exposure and burning is not a good thing… and can be risky to your health. There’s a vital natural biological process that occurs inside your body every day. In many cases, this natural biological process, known better as your immune system function, is a very beneficial to help improve your health. These free radicals can damage your cell membranes and oxidize your DNA. The more strenuous the workout, the more free radicals you produce. The bottom line… you can end up with tired and sore muscles. As a powerful antioxidant, astaxanthin has been shown to effectively scavenge free radicals from muscle tissue and help reduce singlet oxygen (particular type of ‘bad’ oxidation). Any questions why I’m simply amazed at the healthful power of this super-antioxidant? * To date, I’ve never seen anything like it. Fortunately with astaxanthin, this is not as much an issue with supplements. How so? Well, that I’m aware of, synthetic astaxanthin is not used in any supplements for consumption by human beings. The bad news is synthetic astaxanthin is still most commonly found in animal feeds. 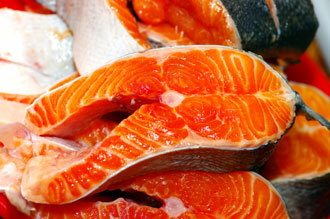 So, if you believe you’re eating healthy by consuming salmon, but the salmon is not ‘wild’ or ‘naturally colored,’ there’s a good chance you’re consuming synthetic astaxanthin indirectly. That’s where often times synthetic astaxanthin fits the bill. Some aquaculture companies are considering using natural astaxanthin because it’s healthier for the salmon and has superior pigmentation advantages. There’s only one main barrier preventing most from doing this… it costs more. 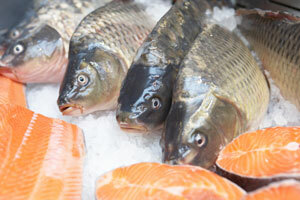 So, what, in my opinion, is the best way to get natural astaxanthin? To me, one of the best ways to get natural astaxanthin is through supplementation. Don’t get me wrong, wild Pacific salmon is an excellent alternative. You may already have recognized the name ‘astaxanthin,’ because I’ve mentioned it before on my site in reference to krill oil, my favorite source of animal based omega-3 fatty acids. Make sure the astaxanthin formula is created from natural marine microalgae and not some form of fungus, or some other less effective form. Due to the fact astaxanthin is best absorbed when taken with a ‘fatty’ meal (lipid soluble), look for a formula that contains some sort of natural oil or fatty acid that will help maximize your absorption. Without this additional ingredient, your absorption could be less than optimal. In addition, make sure the manufacturer can provide solid evidence they don’t use chemical solvents or preservatives in their formulation processes. Due to new research, most recommendations for daily dosages of natural astaxanthin can now range from 4-8mg. So, look for at least a 4mg minimum serving size so you won’t have to take as many capsules.